So with this background when yesterday I was invited to write a “Comment Piece on Arnab’s Interview with Narendra Modi” I spontaneously agreed and sent my willingness to write this article. Post 31st March Narendra Modi started giving series of interviews to various channels as per BJP’s planned strategy and purposely avoiding all national news channels. Frankly, all interviews sounded me staged and preempted and I found hard to digest any of them. I kept following Narendra Modi’s interviews hoping that someday a Journalist will show courage and will ask tough and right questions to Modi and will cross examine him for frank answers? Narendra Modi’s interview with Arnab came with un-believability as it has nothing like Times Now’s usual spirits – it was calm, Arnab was quiet, Modi spoke for 4-5 minutes uninterrupted and Arnab never interfered, Questions appears to be pre-agreed, cross questioning opportunities were let go, Arnab’s sharpness was missing and he never diverted from given directives. But Arnab’s Modi interview reminded me about interview of Murli Manohar Joshi which was taken by Sumit Awasthi of Zee News on 21st March 2014 where in Sumit Awasthi chose to walk out and refused taking interview as Mr. Joshi wanted to stage the interview and wanted Sumit to be selecti ve with his questions, something which he spontaneously refused to agree. I am sure that this piece of news was missed by elite English speaking class of viewers of this country. Also in the game of up man-ship, no other media channel was interested to talk about this incident and high journalistic values demonstrated by Sumit Awasthi and whole incident went unnoticed. Yes, it’s a different thing that Sumit may get an award for his courageous act but immediate advantage was lost. This was an opportunity when Journalist could have come together and may have sent a signal to Political Class that they are not fine with staged interviews. 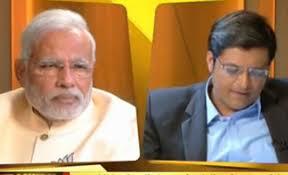 Post Modi’s Interview with Arnab I was left wondering – why this interview? What was the need? Why Times Now was desperate to have Modi’s Interview and at what cost? Media has changed, but has the journalistic values too have changed? What’s important? With hundreds of news channels in India, Paid News and interests of Media Owners are surly going to impact journalistic values of day to day news reporting. But it is responsibility of Journalists (and not media owners) to protect the freedom of Press and be true to their viewers, readers and country by large with their authentic reporting and honest job. I just wish post elections various Press federations and associations gets together and put up a combined thought on how Freedom of Press is protected and how high journalistic values are maintained.